The centerpiece of this mystery is a beautifully illustrated book by the 17th century itinerant poet and master of haiku, Matsuo Basho. It is a book that belonged to Prince Hirohito of Japan. On a steamer returning from India, Russell and Holmes become acquainted with a diminutive Japanese woman who invites them to spend a few days with her in Japan to learn more about her country. Accepting the invitation, they soon find themselves trying to foil a blackmail plot that has international implications. There is the flavor of Japan throughout this mystery, with each chapter headed by haiku. Much of the first part of the book is slow-paced with Russell and Holmes making their way to a small village near Kyoto disguised as Buddhist pilgrims. The culture, customs and scenery of Japan in 1925 are described in lavish detail. I was totally transported and loved the sense that this was the correct order of things. When the story moved to England the faster pace was jarring and underlined the calmness of Japan. 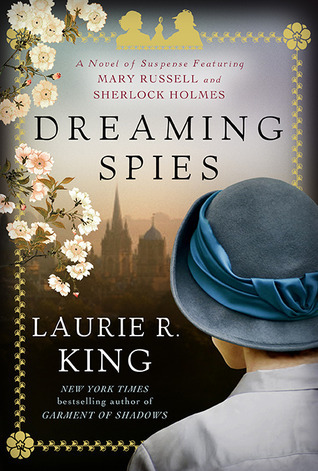 This is my favorite Laurie King book (so far). Everything was just right . . . exotic atmosphere, twists and turns of plot, interesting, intelligent characters and strong women. It is highly recommended for all ages. This entry was posted in mystery and tagged 1920s, Detectives, Haiku, Japan. Bookmark the permalink.